The tour was well organized. Our tour manager did a wonderful job. She was always on top of things. She was interesting and knew considerable facts about the places we visited. The bus drivers we had were top notch. They also related facts of the area while driving. We stayed atbvery nice hotels. All the hotels had restaurants. Breakfast was included everyday. The only complaint I have is the choice of included tours in Sydney. We chose the hop on hop off ferry from the Sydney Harbor. Bad choice. It was very confusing. The schedules did not work. When asked, no one could give us the correct information. We actually were left stranded in Manly. There was no return hop on hop off ferry returning to Sydney. We had to pay to get back. Everyone on the tour got along well we definitely made some good friends on the trip. I would travel with Collette again. The tour was expensive but it was worth the price. Overall good. I had a problem with the office support before I left on my trip. I wanted to upgrade my airplane seats and I felt they did not even try. Horrible communication on this request too. Cairns, Outback, Sydney, Queenstown were my favorites. Thank you for traveling with Collette to the South Pacific. Our notes indicate that both premium economy and business class were sold out at the time you requested upgraded seating. Your comments will be reviewed by our Air Department in order to improve the overall touring experience for our guests. I wished that we had known how expensive food was and we would have been better prepared. So glad breakfasts and many suppers were included. Yes I would tell my friends and family about the trip. Everything was alright but why could some of the side trips been included instead of all the extra expense. Every thing went well ! Very happy with the tour. I will recommend them to my friends. should have arranged for more of some kind of tours for the last 2 days there. Was too much down time. was too much down time....needed to add more tours of different places. We paid the big price...should have included more of other things/places to see. Tour was a trip of what maybe the trip of a lifetime. Dave our tour guide was the greatest. The knowledge and experience was invaluable not only to myself and my wife but I believe wholeheartedly to the rest of the tour group. It definitely made the trip less stressful and more enjoyable. Even what I considered the end of the tour, we were still being guided through the last airport and customs we would have to negotiate when back in the States. I can't say enough about experience in Australia and New Zealand. Wonderful and beautiful countries to tour, excellent tour guide in Dave, and a fun loving group of people to tour with. I don't know how my experience could have been much better. Looking forward to the next experience with Collette. Service was excellent. Tour guide was very helpful and gave very good information. I would highly recommend Collette and would book again. Get a great tour with a lot of extras. Been on tour with Trafalgar. Collette throws in a lot of extras over the competition. Tour of lifetime. Saw Australia from rain forest (Cairns), to desert (Ayers Rock and Alice Springs), to Sydney, to penguins in Melbourne. South Island of New Zealand wS spectacular. A few days to rest in Fiji was the icing on the cake. The tour was great. Things happened when they should, without glitches. Collette gave great attention to detail. It started when I was picked up at home to be taken to the airport in Los Angeles, and it ended when I was brought home from that same airport at the end of the trip. Handling my suitcase was a real help. I have artificial legs, and provision was made for me when it was needed. The hotels, meals, and other things were done well without problems. David Cormier was great. I asked many weird questions about the places visited, and he had answers. I am a botanist, and I was able to see a great variety of vegetation. I and eight others went to Fiji on an extension of the tour. It was handled by Rosie tours. I went on some local tours there. One of the Fijians was assigned to show local plants to me on Tivua Island . I fell and cut myself outside the Rosie home. The people affiliated with Collette sent me to urgent care. Francis Fuata, and two women made sure that I was treated well and promptly. The damage was largely superficial. Francis took me back to the hotel, he arranged for some special things on the tours (including being shown he native plants on Tivua), and he took me and others to the airport when it was time to leave. He was great. I would like to go back to all of the places visited. I went thinking that this would be a trip of a lifetime. It was, but I am now thinking of another trip, though I am not yet sure where I want to go. South America? Europe? The facilities and meals were excellent. Everything happened when it should. Things went well in Australia and NewZealand. David Cormier was great. I fell and cut myself in Fiji, and those who are affiliated with Collette in Fiji stepped in and made sure that I was sent to urgent care.Two women guided me through the process, and Francis Fuata made sure that I was properly treated and sent back to the hotel. The damage was largely superficial. He made sure that the local tours I took in Fiji went well. Things went like clockwork on the tour everywhere I went. Good. I could make a suggestion that I feel would be an improvement. Planning and execution were excellent, the latter due to our tour director, Mark. The trip was planned very well . The tour guide was excellent Mark Godin . The hotels were very nice . My only complain is that not all the baths did not have walk in showers. If there was a problem it was taken care right away . It was a good trip and the tour guide was excellent. Wonderful trip but could have been even better with a few changes. Flights, hotels, buses, meals were excellent. Most of the tour guides were fantastic. The schedule was hectic. I feel some of the excursions could have been scheduled better, or even eliminated. Lots of time riding a bus in countryside that doesn’t change. Experienced some wonderful things that I couldn’t have otherwise. Was great to have everything all planned and scheduled. Loved the camel ride! Every detail was covered...and with care and enthusiasm. Hit everything on my bucket list in Australia, but New Zeeland was spectacular. Guide was very involved. Good tours. Great bus drivers. Good sights. Great bust drivers. Well organized. It was a trip of a lifetime and our tour manager deserves 5 stars! Everything was as good and well planned as possible and the only problem I had was with the coordination of flights to get to Australia. We had a 14 hour layover in LA and that was too long. The coordination of flights and airport guidance was also poorly planned and not communicated to us by Collette at all so we had a very stressful time making our way to our flight to Australia. Perfect balance of exciting sights and enough downtime to enjoy it. Hotels were very good and had everything we needed! Good itinerary. Excellent tour guide. I exerienced some health problems while on the trip an dhe really made sure I was taken care of. The lillte penguins on Phillip Island, Aus. Flight arrangements were mismanaged. Phone calls were not returned as requested to the correct number and times regarding air flights. Otherwise,satisfied. Everything was handled in an efficient and professional manner on our recent tour of Australia and New Zealand. Our tour guide was outstanding in every way. 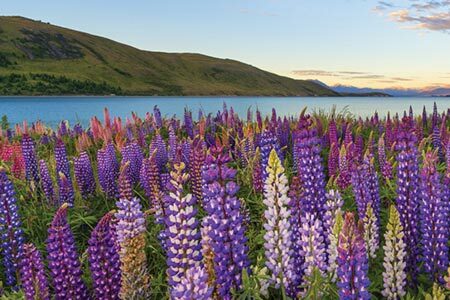 New Zealand! Great tour guide and group of fellow travelers. Great tour of Australia and New Zealand. They put together a great tour and get you around to see all of the major sites. This is the second one I have taken with them. I wish this latest one had been a bit more "active". For instance, after I booked the tour my travel agent advised that a walking tour day had been changed to a coach tour. I would have preferred the walking tour. I traveled alone and felt totally taken care of. I had a great tour manager who looked out for me. I loved the itinerary and felt we had time to ask questions and relax between activities. The tour took us to the places I wanted to see in Australia and New Zealand. We were busy but had time to relax and do things on our own. The tour manager was wonderful and truly "took care of us". In general, I enjoyed the tour & felt it lived up to everything advertised. The tour manager, Toni Ray-Ingram was fantastic & did an outstanding job. However, I think the tour is a bit too fast-paced. By the beginning of the third week I was feeling exhausted. My recommendation is to re-structure it slightly. Eliminate Melbourne & use that time to have one add’l “free” day in Sydney (where an optional day trip to some animal or marine life place could substitute for “the little penguins” option offered in Melbourne), and, one add’l night in Christchurch. The “home visit” with a NZ family was one of the best highlights of the tour, but it should NOT be left until the final night. By that time everyone’s thoughts were on leaving for home the following day ( some of us VERY early the following day) and most of us were VERY tired. I would have enjoyed the home visit much more if it was not left until the final night. So having one add’l night in Christchurch would allow for that. As currently structured, the tour leaves very little time to really enjoy Melbourne (& no free time there at all if you do the penguin option as most people do), so I don’t think it would adversely affect the tour if that was eliminated. Having an extra day each in Sydney & Christchurch would allow for a slightly slower paced tour & make it much more enjoyable. I would have given this tour five stars except for that. As I said earlier, it would have been better if the tour was a bit slower paced, which could be accomplished by eliminating Melbourne & using the time gained for an add’l day each in Sydney & Christchurch. Move the NZ home visit to some night OTHER THAN the final night! Can’t emphasize that one enough! My favorite experience was the Sydney Opera House tour. Thank you for traveling with Collette to Australia & New Zealand. Your feedback has been forwarded to the Product Development Team. Your comments on the pacing and layout of the itinerary will be used to enhance this tour for our future guests. This was our second Collette tour, and it was very well planned and executed. Our tour manager, Denise, was extremely knowledgeable, well organized, and ensured that the group's needs were met by all of the local vendors. This trip was a "bucket list" item for us, and Collette did not disappoint. 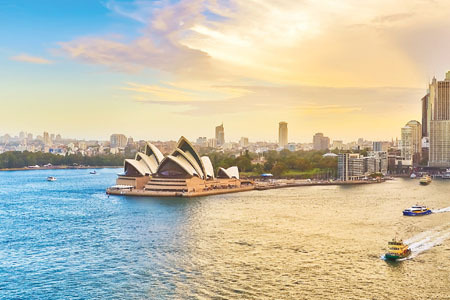 The tour hit the high points for us, and the most memorable were the Australian outback, the city of Sydney, and the south island of New Zealand. 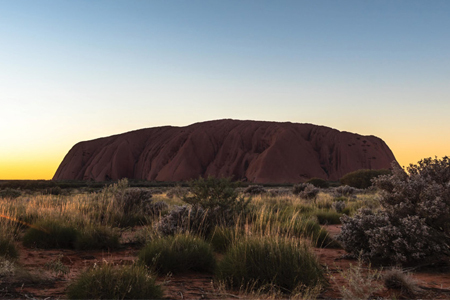 Getting up close and personal with Uluru (Ayers Rock), meeting a few aboriginal artists, and experiencing a "bush dinner" were especially fun. 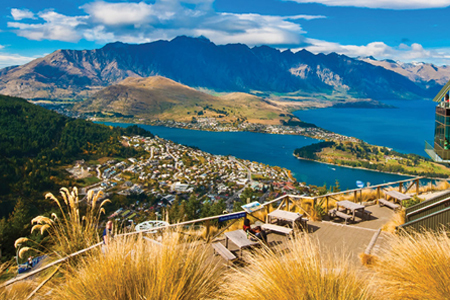 New Zealand's south island is simply stunning in its natural beauty and mountainscapes. The only downside was our final few days in Fiji. While a beautiful setting, the heat and humidity were oppressive. The resort was very accommodating and provided nice amenities, including a spacious guest room, but the only respite from the temperature and humidity were our guest room and the retail shops. The water on the "beach", which itself was very pebbly, was very cloudy, brown and unappealing. Because we had already checked out and did not leave for the airport until early evening, the hotel did provide the complimentary use of their spa to shower and change clothes, which we very much appreciated. Australia and New Zealand - a trip of a lifetime! This tour encompassed such a variety of experiences! We had an excellent tour guide who was with us from our arrival in Cairns, Australia, until we left for home from Christchurch, New Zealand. She was very knowledgeable about the tour and kept all 40 of us up to speed and pretty much on schedule! We felt we could have stayed longer in a couple places, but understand one can't see everything!! We also had excellent bus drivers who explained a lot about our destinations. So many memorable things, but learning about the Aborigines of the Australian Outback was a real highlight. Wonderful tour manager and tour covered all the sights we wanted to see or experience. The optional trips helped to enhance our total experience. We made some wonderful new friends. Collette did goodtours, a great guide, and we stayed in good hotels. Loved the Penguin Parade on Phillips Island. Answered my questions clearly and completely. Wish I would have gotten the pretour information sooner. Great experiences in Australia and beautiful scenery in New Zealand. Did not receive flight information until about a month before we left and some of your notices about hotel changes were not true. It was a complete tour, a taste of the country, made you want to plan a return. Thank you for taking the time to provide us with this feedback. This has been passed along to our Client Care Center to ensure our pre-tour communication processes are more accurate and efficient. Very disappointed in third party airline arrangements. Long delay (days/weeks) between time of request and response. Crazy airline routes on top of an already long journey. Miggi our tour guide did a great job handling our large group of 44 people through multiple airports and two countries. Travel route for this tour needs to be revamped. Traveling by air over 24 hours with no sleep and starting the first day of the tour with a long day of boating to the Great Barrier Reef is not the best way to start this three week tour. Group was too large for this type of hectic travel itinerary. Too many one night hotel stays in a three week tour. With the limited time in each place and very little non-group time, we were never able to enjoy the interesting places we visited. \nDue to Collette’s many tour packages which take place around the world, long plane flights are sometimes required. We understand that this aspect of the trip may be a bit challenging at times especially when there are connecting flights. Based on your origin and destination routes we had to work within the parameters of the program and airline flight schedules. Very enjoyable although quite rigorous. Tour manager (***** ****) was excellent. Places we visited and saw were all really nice. Would have liked to stay longer at a couple of the stops (especially Mt Cook in New Zealand). The tour negatives were (1) size of the group - extra time needed on all stops to get on and off the coach added hours to the trip and (2) making airline arrangements when booking the trip was very aggravating - use of a third party and the many days in between trying to obtain the best flights was not a pleasant experience. Took several weeks of back and forth and even then couldn't get what we wanted. Much different a couple of years ago when we went to Italy with Collette and airline arrangements were made same day on the phone. Company needs to seriously considering going back to the 'old' way. New Zealand geography was spectacular. The organization of the trip was incredible. The travel from place to place worked exceptionally well. We loved the coral reef, the outback and the cities of Australia. We especially loved the contact with the aboriginal people and learning about their stories. Uluru was spectacular. A picture does not do it justice. New Zealand was also spectacular. We especially loved Milford Sound and all the waterfalls. Queenstown and all the adventures available made a memorable trip. Fantastic would definitely book with them again. The package they put together was fantastic. They optimized our time to see the maximum amount of the country visited, making the trip educational and enjoyable. They accommodated our requests. There was so much going on every day I cannot pick a specific experience. To me, it was all amazing and memorable. From the scenery to the nature to the explanations given about everything we were doing, it was so much more than I expected. This tour was really the experience of a lifetime. The tour manager was so good when we left I felt like we were leaving a friend. I would recommend this tour to anyone. Collette's service was very good. No issues there. All of New Zealand was beautiful. In general, the whole trip was well planned with about the right amount of time spent in each area. I think doing assigned seating on bus tour days is an excellent idea. Our tour guide, *** ********, did and excellent job. You provided an excellent tour, with great highlights of the countries. You also provided an excellent tour guide that took great care of us and presented the highlights and other facts that made it great. To experience the out back and meet the natives, and also learn their history and experiences, was also an interesting point. Then to travel and see the glaciers, what a contrast, and to see what they have done in the country was great. I travelled with Collette before. On this trip I was surprised/shocked that Collette's rep (she called herself a manager definitely not a guide!!) would emphasised almost daily that she was a manager... she didn't answer questions- she had drivers for that. and driving thru the narrow roads they did! they fumbled with microphone and narrated/guided winding thru the traffic.. rather dangerous if you ask me.. you can not talk to driver on public bus where I live.. go figure... we spent hours each day waiting in hotel lobbies waiting for our manager to "count" luggage...one day we waited even more when she couldn't find the owner of a small carry-on only to realize (half an hour later..) that it was her own! that was annoying,, the other time she kept counting people on the bus.. and one was missing,, so she re counted and counted again.. only to realize that she didn't count herself in the tally... no ,,, you cannot make this up... you had to be there... we had to carry our luggage from conveyor thru the street up with elevators then down again, to our bus???!! After spending all day in a bus, arriving in hotel just minutes before scheduled dinners, we were advised to .."porter" our luggage into rooms.. because it .."might take some time for hotel porters to get it to our rooms??!! I believed that I paid collet for luggage handling?? some hotels were outstanding! some rather mediocre!! carrying my luggage from a/port conveyors and hotel lobbies (after I paid Collette for this service??!!) looking from my hotel window , trying to see the famous mt cook.. and seeing just the brush, bushes. dump.. our rooms were all in the opposite wing in the basement area!! Hello, thank you for your feedback. A representative from Collette will be reaching out to you directly to learn more about your experience. Hello,\n\nThank you for bringing this to our attention. We have passed this along to a member of our guest relations team who will be reaching out to you to learn more about your experience. If we can be of any more help, please feel free to reach out. Overall Collette was a good choice for this tour, other than a few hick-ups, it went smoothly. It has to be the experience at Uluru just outside Alice Springs. Despite the rain at the rock(which had not had rain in 10 months) we thoroughly enjoyed the experience. Very well organized with many unique opportunities. I especially enjoyed the experiences with Australians and New Zealanders. I enjoyed unique experiences and options available. From the time we began planning, Collette and their customer support representatives were very helpful with their planning suggestions and advice. This continued all the way through our return home from a memory-filled trip. This was our first experience with international travel, and it was also our first experience with Collette. We were very happy with all aspects of the tour. There were only a few glitches that were handled very well by our tour manager. Wonderful tour! Would definitely do another Collette tour. Loved that the Tour Manager took care of everything and I didn’t have to worry about any of the logistics. Would have liked to have had our documents sooner to allow sufficient time to completely review them before our departure. We received them less than a week before the tour. Most aspects of the tour were great! Loved that the Tour Manager took care of everything and I didn’t have to worry about any of the logistics. The one thing that I didn’t like were the one-night stays in many places. With the one-night stays I felt like I didn’t get to experience the town at all. Would loved to have had more time at Mt. Cook and Phillips Island especially. I did feel like we got to experience a lot, and especially enjoyed time spent with the locals, ie., host dinner in NZ, outback dinner in Australia, and the farm visit for tea. Also really enjoyed the optional train ride to Frank Josef and the snow plane option at Mt. Cook. I appreciated having a driver service for airport transportation. Our tour manager, **** **********, was just a wealth of knowledge. The insight he could give to the countries were traveling to added a richness to the experience I never would of had traveling on my own. He was great at suggestions for free time and the directions he provided to get there, well as the Australians say "spot on"! We had a lot of country to travel in 19 days. Each day felt new and full of adventure. Up until the day to return home I kept saying it can't get better than this, but it did. I loved Alice Springs and Uluru. It was a part of Australia you never see much about. The culture and people were amazing. New Zealand was breathtaking. All the towns we stopped in were extremely friendly and so willing to talk about their home. Most of our trip was really very good, but I do have some suggestions. First, no one was at the airport to pick us up after 33 hours in transit. I finally reached a Collette representative and a man showed up in a car too small with poor personal hygeine. Once we arrived, the hotel was fine, but we learned that the remainder of our tour would be a day late due to a flight cancellation. I had arranged my own flights and arrived a day earlier. This change for our tour forced us to have a very rushed first day experience. We also lost a day due to another Virgin Australia cancellation en route to Alice Springs. Hiring an unreliable airline to save money resulted in an important piece of the tour lost. The hotel that put us up told us that this was VA's third cancellation that week. Quantas, which we finally flew was the better choice and should have been used in the first place. As for the tour itself, it was very rushed. I would have preferred more days in one place. Fly from Cairns to Alice Springs, have a couple of days there and in Uluru. I could have skipped Melbourne. Sydney was just right. Would have liked to have hiked at Franz Glacier and Mount Cook. Queenstown was just right. Do not have the home hosted dinner the last night, instead, let people say goodbye and have the last night together. All hotels were totally fine. For these reasons, I could only give this tour 3 stars. Sydney and Ayers Rock were my favorite experiences. Hello, thank you for sharing this feedback with us about the tour. We have passed this along to members of our team for review. We appreciate you and value your insight as it helps us to improve our tours for future guests. Trip was great, saw a lot did a lot and ever thing was set. Tour director and driver were excellent, both had a lot of knowledge of the area. Highly recommend Collette in every aspect of the trip from beginning to the end. The tour director **** was excellent in all aspects, very knowledgeable as was ***** the coach driver, personable and polite!! Both made the trip a "WOW" with all that we saw, did, options too, and the great new 44 now "friends" we met. Thanks. From the Metro Car, the flights, the places we visited, the things we did and even the options were all well worth this bucket list trip.Besides the tour itself the options well worth considering like our Camel Ride! and the 4 Wheel Drive! and more. **** was the best guide we've had on any of our trips. Trip needs a little more time in Melbourne as overnight with an AM drive around is a bit short. New Zealand was AWESOME!!! Enjoyed the "little penguins" and everything in New Zealand. Well organized, telephone reps were friendly and always able to help even when we had delays with our flight. Only tour we saw that includdd the Australian outback. Optional excursions we're fantastic! Everything was amazing! Hotels were clean and good quality, included activities, options, the other tour members all made this a trip of a lifetime! My favorite activity was climbing the Sydney Harbour Bridge. I loved the blend of city and outback experiences. Only thing that could have been better was our tour manager. He was knowledgeable and organized and performed the basic requirements of his job, but his personality was sorely lacking. He was very controlling and got irritated when guests asked him to repeat directions or posed questions outside of his prepared agenda for the day. He was actually sarcastic and confrontational at times to some of the guests and to me personally. This is the only reason I'm not giving 5 stars. For the cost of this trip, guests should be able to ask questions at any point on the tour without incident and should never be made to feel like they are annoying. Fortunately the quality of the tour and the amazing experiences we had way overshadowed his shortcomings. Our coach driver in New Zealand more than made up for it with his narration and personal stories. With any other tour manager we would have had a five star experience! I would still travel with Collette again provided I had a different tour manager. Information provided in advance detailed and helpful in planning for trip. Agent that assisted in making travel flights to and from home excellent. Great options, however, some included stops could have been excluded to provide more time in places that were too short. It was quite an adventure to be on so many modes of transportation and to visit such a variety of places. There were so many choices for exhilarating experiences, and although the tour group consisted of mainly a 60-plus age group, it was never assumed -that we couldn't handle it. There was also the choice to lay back when needed or to not participate in certain things. I'm happy that my friend and I did try just about everything. We also had a nice glimpse into local cultures by visiting private homes, farms, wineries, and a venue in the Outback, among other things. Our tour guide, *Personal Details removed by Feefo* and the various drivers had a wealth of knowledge. Great job, Collette! Travel arrangements were generally excellent. The only problems we experienced were not within your ability to control, particularly the problems we had in LA, with the movement from domestic to international terminals. The tour itself was excellent. The only complaint we had was the frequent "one night stays" at various hotels, with the continuous packing and unpacking. Due to the distances between various events, this was understandable, but still an irritant. Our tour guide, *Personal details removed by Feefo* was an example of excellence, with her knowledge and attention to details involved in the tour. This was our second tour with Collette and both were truly outstanding. We'll certainly consider Collette when we decide on our next adventure. The tour, and the events included, were everything we had hoped for. Too many locations and events to really single out any particular one to mention. Enjoyable trip - saw so much! Everything went without a hitch. No one lost luggage, everything was as scheduled. No problems. Only suggestion would be to travel in a more logical manner. We flew to Queenstown only to fly to Christchuch, then drive back to Queenstown. Seems like a waste. So many memorable experiences because we saw so much. trip hit all of the necessary places to see. At times a little too much but we understand the regions dictate that. Excursions compiiment. excursions we took were good. Not enough free time. Had to fly too much. Should have gone from Cairns to Alice Springs to Melbourne to Sydney. Should have charter flights for 40+ passengers. We had 42. I liked the Great Barrier Reef. I liked New Zealand better than Australia. Beautiful country. Needed to include drinks with the dinner on the Steamship to Dinner excursion. The sing-a-long on the way back from the dinner was fun. The best part of the trip was the Fiji extension. I do appreciate the late checkout at the hotel. Tour guide was good. She did let 1 couple get away with being late nearly every time. She had to "baby sit" them the whole trip. It was a good trip, but it did cost way too much for what we got. I really do think you should see if you can get charter flights in Australia. New Zealand was a really pretty country. Fiji was the best part. The hotels were good. The boxed breakfast at the Sydney hotel was NOT GOOD. The one at Christchurch was better. I do appreciate having the boxed meals though. 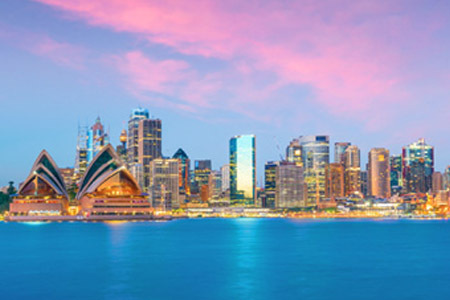 It would have been nice to have a hotel in Sydney in the harbor area although the other one was ok. I know it is necessary to fly to the different places in Australia, but maybe charter flights instead of commercial?? That was a very expensive trip and I think we spent too much time in airports. We also could have used a little more free time. The Flying Doctor and telegraph sites were good, but I would have enjoyed more time at the pool at the hotel. *Personal Details removed by Feefo* was an excellent tour guide. The drivers were pretty good. The driver in New Zealand was excellent. I enjoyed the dinner in the Hunt's home in Christchurch. I really enjoyed the Great Barrier Reef! I didn't know all that was below the ocean surface! !I It was a good trip. We didn't have much free time though. 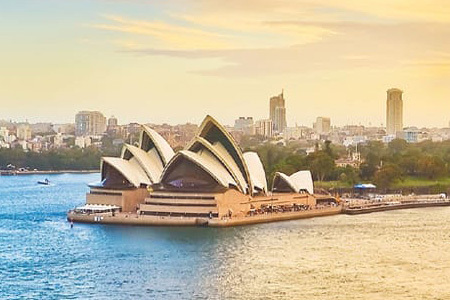 It would have been good to know that it was possible to get tickets to an event at the Sydney Opera House before we had purchased "A Night Out in Sydney" excursion. It was the date of the excursion when we found out we could get tickets to the performance and it was too late to cancel. Also in New Zealand at the excursion on the TSS Earnslaw Steamship to Dinner cost $105 per person. For that price, we should have been given at least 1 glass of wine and at least a soft drink for dinner! They were charging extra for them. We had to drink water or pay extra. For that price they should have been included. It was really good to go to extend our trip for the last 4 days to Fiji. I appreciate the late checkout Collette provided for us. That was so nice. Thank you. I did recommend this trip to a friend. She and her husband will be celebrating a milestone anniversary in 2 yrs. She said they are going to start saving for this trip. Their airline travel department is really poor. It was ok for booking but when changes had to be made at the last minute they were totally uninformed. Thank you for bringing this to our attention. We have passed it along to our customer care team so we can improve the tour for future guests. Your feedback is important to us and we look forward to traveling with you again on a future tour. Local tours were very excellent. Our tour manager did an outstanding job! Everything was arranged and well-coordinated. He made the air travel in country very smooth. Some of the hotels were outstanding but there were a few that did not meet our expectations. The hotel in Sydney was too far away from the main attractions. Restaurants where Collette provided meals were mixed as far as satisfaction. The Greek restaurant in Sydney was not good at all. The lamb was extremely tough and fatty. No one in our group ate it. The hotel restaurant in Queenstown had good food but the service was worse than slow. All breakfast meals were terrific! We were very pleased with the number of attractions we were able to see in the 3 weeks but it did require being on the tour bus most mornings by 7 a.m. A couple of mornings we departed before daylight. It seemed we never had dinner before 7 or 7:30, which was late for us. Our favorites on the tour were: petting kangaroos and koalas, Ayers Rock, Great Barrier Reef, Penguin Parade, Journey through Middle Earth and Mt. Cook. Australia and NZ in 3 Weeks -Bucket List Happily Accomplished! The tour guide, variety of experience, meal inclusions, and pace of the trip were excellent! We have already recommended Collette to several of our friends. This was a "bucket list" trip and didn't disappoint. We actually spent less money on meals than planned, since there were enough included meals in the tour. The hotels were centrally located, which gave us opportunity to explore on our own, and the tours started early enough in the day that we packed in plenty of sightseeing. 3 weeks sounds like a long time - but we were entertained and knew what to expect each day. This was largely due to our tour guide who had amazing attention to detail. Her transportation coordination of internal flights alone was amazing. The variety of available activities really made this a great trip. Here are a few of my favorite things: -Seeing an opera in the Sydney Opera house after learning about it on the morning tour was fantastic. We enjoyed having dinner at a cafe on the dock and the view of the bridge and opera house prior to the performance. -Toasting with champagne at Uluru rock at sunset was a treat. -Snorkeling on the Great Barrier Reef was a highlight too. I never thought I'd be able to do something like that. -The aboriginal led hike through the rain forest in Cairns gave us insight into their way of life.The ruggedness of the trail made it more fun. -The view of Mt. Cook in the The Hermitage hotel was outstanding. -The tea and scones at the NZ farm was a treat and really getting to talk to the farmer after he sheared the sheep was fun. -Dinner with a NZ family on our last night really gave us insight into the way real people live. Our hosts were warm and friendly. Overall an excellent vaction with a wonderful organized tour manager Dave. Very well organzed tour director, worry free travel. Good food and excellent accomodations. Good location of hotels. Excellent locations and good experience from Outback to the modern. Too much time was wasted in flying to the same locations over and over again. The tour lay out could be better organized. We're pleased to hear you had a great time touring the Outback! Thank you for sharing your feedback about the flights and organization of the itinerary. We will pass it along to our product team for review. We appreciate you and look forward to travelling with you again soon. Trip was great but the service prior was less than expected. I talked to 5 different people and got 5 different answers about whether or not I would be able to scuba dive on this trip. if they don't know they should say so or find out. also, our flight was cancelled and I expected more help with finding other flights than what I received. in fact, I felt you should have known the flight was cancelled and notified me?? Loved the camel ride at Uluru, Sydney, and all of New Zealand scenery. Thank you for your feedback, we’re going to pass it along to our Reservations and Air Teams to look into. We had a great trip, everything went very smoothly without any hitches. Our Guide, Michael Oghee was excellent! He was very knowledgeable and his attention to detail made our trip effortless. We love the unexpected, so when in Cairns the fruit bats were very unexpected and enjoyed. The optional tour for the Little Penguins was amazing, Milford Sound was magical. Overall the service was great. The only problem I had was getting detailed info for optional excursions. It was not available on line but my travel agent was able to get the info after direct contact with Collette. This just caused delays in decision making. Getting the opportunity to climb the Sydney Harbor Bridge. That's my kind of getting high. Trip of a lifetime! Well designed, comprehensive and well-paced. Loved it all fabulous tour manager ********** made the trip. Knowledgeable when called for information. Sometimes lines were ******* and hard to get through to an agent. Printed travel guide was an excellent resource while on the trip. Overall a very rewarding excursion. Some included attractions were less than stellar. Vacation of a Life Time, So Much to See. enjoyed every part of the Trip..
Our Tour manager was professional informative and fun. He helped us experience our trip as an adventure and handled any bumps that arose, like disappoint over cancellation of the Koala Park and not getting to see the youth at risk. I liked the small group - it allowed us to get to know our fellow travelers well. It is difficult to pinpoint to provide your favorite memorable experience, there were many from snorkeling in the Great Barrier Reef, experiencing Ayers Rock to sailing in Milford Sound. They were all great. Service was good. Got us all the discounts available, got us room with view at our first stop, had expedited TSA pass at airport. Would recommend company and use again. Wish that we had known in advance that many hotels had laundry rooms for guests to use, that would have meant that we would not have had to take so many clothes. This was a trip of a lifetime for me and Collette could not have performed better. Service was excellent from my first phone call, people very knowledgeable and willing to look into any request I had. I questioned the air schedule and people got back to me to answer my questions and give alternative flights. Showed me that the flights originally booked were indeed the best ones. Spoke with many different agents and each one was as considerate and knowledgeable as the other. Very good responses. I would absolutely recommend this company and already have. 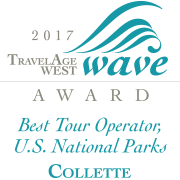 I had already booked my next trip with Collette Tours. This tour included the Outback which was one of the highlights for me. The tour of Sydney Opera house, Rainforest, the Great Barrier Reef, Cook Mountain, Franz Joseph Glacier. Too many experiences. I can honestly say that each day brought something new and exciting. I took advantage of many extras offered and also went along with our tour guide, who walked with those of us who wanted to see it all! She made this trip an absolute joy with her knowledge, attention to all details of our tour, her enthusiasm and her willingness to show us extra sights in whatever free time we had. Due to early arrival times into some cities, rooms may not always be available for immediate check-in. Due to changes in air schedules whilst on tour, the order of days in the itinerary may change. The internal flights on this programme are not included in the land price of your tour. These flights need to be arranged and purchased separately if you arrange your own air. Internal flights are included with the air portion of your tour if you purchase air through us. *Please note that the Collette Foundation site may not be available for visits due to school holidays, weekends or programming challenges.